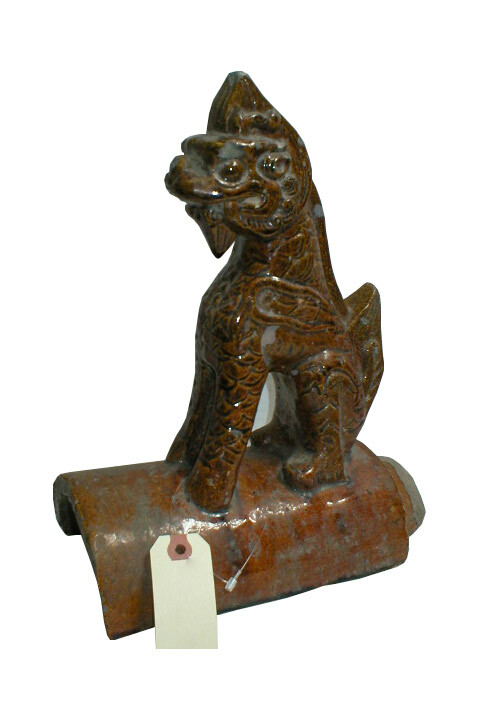 This is an interesting smaller size ancient Chinese roof-tile of a kneeling mythical animal that is a dragon but looks like a Chilin with the same features such as horn and scales. It is in a beautiful rich chestnut “Liu-Li” glaze. Contrary to the large dragon tiles shown before which were placed horizontally at the two ends of the top of the main roof, this roof-tile was among a group of different beasts and auspicious creatures called “kneeling beasts” placed on a roof in a semi-vertical and diagonal line in descending number. Usually, there was a guarding immortal riding on a large bird placed at the very front, the edge, of the line. After that, the dragon was the first one to follow, then, phoenix, lion, etc. These wonderful creatures once graced the ancient Chinese buildings and cities as they gazed into the far space in the universe and served as the protection for the building and the generations. They are also wonderfully and poetically called “Wang Shou 望獸”. While “Shou獸” means beast or animal in Chinese language, “Wang望” means looking ahead or gazing with a sense of hope or expectation.